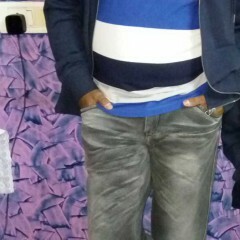 He is part of the senior management in an automotive company. He travels 14 days a month and his works long hours that sometimes stretches into late nights. He tried to manage and fit into a workout regime twice or three a week but could not be regular. 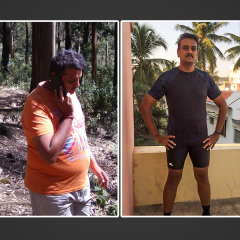 At 52, he wanted to change his lifestyle but ,was unable to do it on his own. He needed an external stimuli……and guess what he found it and today he is active and has learnt to eat and live smart……let us hear Bharatendu Kapoor’s story in his own words…. I head the spare parts business of a Mumbai-based automotive company and my job involves procurement of spare parts for all our projects and supply spare parts to all the auto divisions including truck and buses division. My work also involves travel for about 12 to 14 days in a month and long hours on a daily basis. This daily routine and constant travel led him to adopt irregular food habits. I would never have food at the right time. However, I would try and work out twice or thrice a week for about half hour to 40 minutes. I was not regular though with the workouts and the days were not fixed.Sometimes I would go for walks but again it was not very regular. Such was my irregular routine for several years. Then one day in November 2015, through an engagement program my company bought 200 GOQii bands. I was one among the 200 employees who got the band and my journey with GOQii started. GOQii was a boon in disguise. I am 52 years old and I was going through this thought process of wanting to change my lifestyle, considering the job I do. Given my age and lack of understanding about exercise and nutrition, I sure needed an external stimulus to help me through this. And, GOQii was the answer. The best part of GOQii is the coach who you can interact with on a daily basis. The coach is the external stimuli that helped me. The coach guided me on my lifestyle, nutrition, sleep etc. Sheetal, helped me make small changes and disciplined me in my eating habits. I am very conscious now of what I eat, how much I eat. It has been a wonderful experience for me in the last 5 months . Lots of other improvements also came within me. My water intake that was very less has increased considerably. I have an alarm system that reminds me to drink water every hour. Initially, when I started, the first month was tough and tiring for me to adjust to the new kind of fitness regime and making lifestyle changes. Eventually, as days passed I got used to it, I diligently started following the routine. I went for my regular daily walks, met my daily step target, slept well and hydrated well. The most interesting aspect is that the results are evident and the changes were visible. I lost 6 kgs and about 3 inches. Such positive results keep you motivated. The result prompted me to refrain from using the elevator and instead take the flight of steps in Office and this has become a daily habit for me. Believe me, when I say this that I have never been happier with myself. My main health goal when I started on GOQii was to lose 8 kgs and after 5 months I lost 6 kgs which are a great achievement for me and my coach. If I reflect back into the 6 months prior to GOQii, the changes are very little. I have not done anything drastic. But, I have learnt how to live smart and eat smart and become more energetic. Instead of sitting on the chair throughout the day like I used to do earlier while in Office, I started walking after every two hours. So just change a little and that’s the trick. Before using GOQii band I was barely walking 2500 to 3000 steps after I got the band I set for myself a goal of 10000 steps daily and in the last three months, I have been easily crossing 15K steps on a daily basis. Walking and exercises have become part of daily routine. People around me are noticing the change in me and that makes me feel good. What does coach Sheetal Shah have to say about Bharatendu? Bharatendu’s job involves a lot of travelling at least 10 – 15 days a month. Due to his work schedules, he was unable to dedicate time daily for workouts etc . 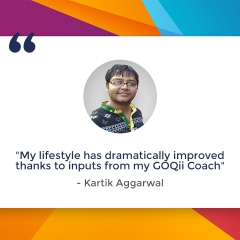 When he joined GOQii in November 2015, his long-term goal set is to lose weight. His smart goal was a brisk walk of 45 minutes initially and 30 minutes normal walk in the evening. In the second month, I shared some strength training workout videos with him. Now he does Brisk and Strength training workout regularly. His water intake was pretty low..but that has also improved now and has increased to approx 2.5 liters in a day. Bharatendu does not have any medical conditions nor he is on any medication. He is very much dedicated to the planned goals and follows them consistently.He logs the food data and syncs the band religiously. 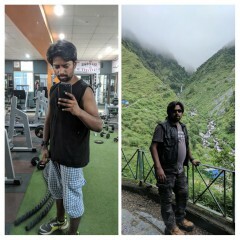 He has lost 6 kgs in the last 5 months. In Nov 2015, he weighed 78 kgs and as of April 2016, he weighs 72.1 Kg. His target is to reach 68 Kg. He has lost inches around his waist. We are now concentrating on fat loss rather than weight Loss. I monitor his meals and other data on a regular basis and suggest him dos and don’ts about healthy meal pattern.